In the first stage, the operator needs to enter the Operator ID and password, which can be entered by scanning a badge. In the second stage, the operator needs to report the function, like progress on a work order or a special operation like a break. In the third stage, the operator needs to report how many pieces were finished for the production if working on a work order. Based on the BOMP Global Setup, control will return to the first stage or second stage. The operator always needs to enter the activity. The system will determine if this ends an operation and prompt for additional information if necessary. At the end of the day, the operator needs to “start” a special operation, End of Day, to log off. The operator must first enter an Operator ID and password. To manually type the data, you must enter the Operator ID, press Enter, type the password and press Enter again. On the other hand, you can scan the barcode on a badge. Press the F1 Key to toggle between scanning mode and manual mode. The barcode scanning mode will prompt for a much longer string to allow for both fields. After successfully authenticated, the system will display on the top 3 lines information about the operator and what this operator is currently doing. The operator can currently log off the system, work on a production, work in a work center, or perform a special operation like a break. The system will display different details for different activities. On the right side of the third line is a two decimal number (in figure 17 it is 0.89). This is the elapsed time of the current activity in hours. The system will prompt for the order number after the first stage. In the second stage, the operator can report what to do next. This can be to start a new production, resume a suspended production, report for a current production, start a break, go to a meeting or log off from the system at the end of the day. Each activity is defined as an operation in WO+ and each operation has its own number. These are the numbers that are entered in the second stage. They can be scanned if a barcode is provided for these numbers. There are two operation types for different activities, Order Operation and Special Operation. Order Operations are those defined in the routing of work orders and are used for production activities. The work order number and order operations must be entered. Special Operations are for activities other than production related. Special Operations can represent a break, a meal break, a log off or other purpose. So to report production related activity, use the Order Operation and the operations listed on the Traveler. Otherwise, use a Special Operation. Figures 18 and 19 show the screens after entering an Order Operation or Special Operation respectively. The order number of an ongoing production. If a special operation will be entered, this field can be blank. F1 - Start a Batch Production. A Batch Production allows you to work on multiple work orders at the same time. Labor and Machine time will be distributed to each work order based on reported quantity. F3 - Advanced Options. Options include inquiry of the current status (operator time clock or production status) and changing the interface behavior. F4 - Exception Handling. Exception handling options to change the activity time or change the current activity content. F7 - Enter a Production Number. If the Production Number is known, you can enter it instead of entering the order number and operation number. Normally, the system will automatically determine the proper production number after the order number and operation number are entered. Defaults to the current work order number. The operation number of an ongoing activity. If the order number is blank, this field can only be a special operation. Otherwise, it can be both an order operation and special operation. 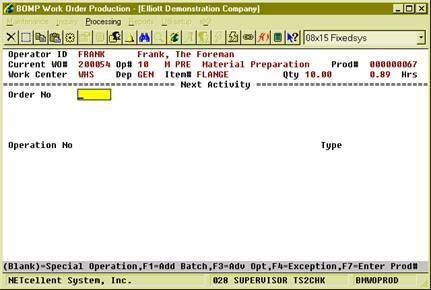 F7 - Search for an order operation, if the order number is not blank. Search for a special operation, if the order number is blank. 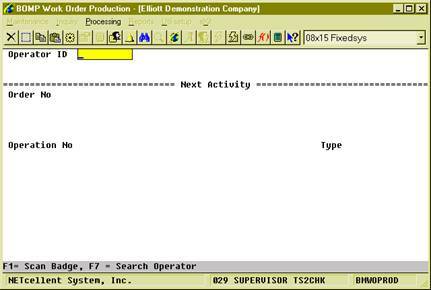 F8 - Search for a special operation, if the order number is not blank. The system determines the next activity based on the operation number. · If the operation number entered is the same as the current activity, this means the operator wants to end the current activity and the next activity has not been assigned. The system will change the operator’s current activity to “Idle”. · If the operation number is for a special operation (from 9000 thru 9999), the system will determine the next activity based on the operation type. o For a break, productive and non-productive operation types, the system will change the operator’s current activity status. o For a meal break and End Of Day operation types, the system will log the operator off and the activity status. 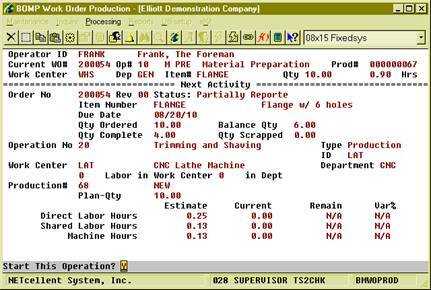 o For monitor operation types, like W and D, the system will change the operator’s activity to a work center or department shared labor. · If the operation number is an order operation, from 1 thru 8999, the system will try to determine the production number. o If the productions for this operation are not yet started, all completed or all worked on by another operator, the system will assume the operator wants to start a new production for this operation. o If any production is suspend or active without an operator and the production was previously worked on by the operator, the system will assume the operator wants to resume, continue or report for that production. o If the system is unable to determine the production number, a list of productions will be presented for the operator to choose from. If the operator is going to start a production for an outside process, the system will prompt for PO related information, like vendor number and PO number. You can enter this information now or when reporting. Enter the planning quantity for a new production. F4 - Change Operation. If this operation has not been started, you can change the value for this operation. After entering all information about the next activity, the system will prompt for confirmation. This confirmation question may vary based on the next activity. For example, if you want to start a suspended production, the system will prompt “S = Start This Operation, R = Report This Operation”. The latter option will allow you to directly report for the production without scanning the same operation number again. If the operator’s activity is for a special operation, like a break or meeting, the system will change the status to the next activity. The operator will not need to report for the current activity, except for a required comment. Otherwise, the operator will be required to report for the current production before starting the next activity. This will bring you to the third stage, current production reporting. In most cases, the only requirement is to enter the quantity of completed pieces. However, WO+ provides several functions for different situations. Usually, only the completed pieces and the quantity need to be reported. However, the quantity entered should not be zero. If this operation is a material issued point, the system will show the list of issued material to confirm. If this operation is the last operation and the product is a serialized item, the system will prompt for a serial number. If the operator wants to stop working on the production, but the production is not completed, a zero can be entered in the Qty Completed field. This usually means production is suspended, but in some cases, like with a CNC Machine, the production can be continued without an operator. The literal right of the “End Date/Time” will indicate if the production will be reported, suspended or continued without an operator. You can report if a CNC machine will continue running or not by pressing F3 for Advance Option and selecting the “Machine On/Off” to change the status of the machine. If the machine is off, production will be suspended. The default value is defined in each work center file through the “(Machine) End By Def If Labor End” field. If some pieces are scrapped during the production, the operator would need to report the quantity scrapped. There are two ways to report this. If BOMP Global Setup field 52, Warning If Plan & Report Qty Are Different, is set to “Y”, the operator will be prompted for the quantity scrapped. For example, the prompt for reporting 7 pieces when the planning quantity is 10 would be, “Did you scrap 3 pieces?” Respond with “Y” and the system will report 7 pieces completed and 3 pieces scrapped. Respond with “N” and the system will report 7 pieces completed and zero scrapped. Whatever value is in the BOMP Global Setup, the operator can always press F5 for Detail Report to report the scrapped quantity. If an error occurs when the operator enters a completed quantity, the system will ask you to use the F5 option. 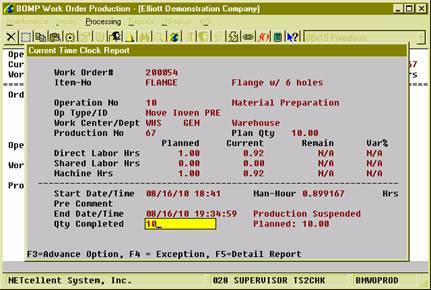 Press F3 for Advance Options to inquiry the current production or your time clock entries. If an exception occurs, the operator can press F4 for option to handle the exception. The system will provide a list of options based on the authorization in the operator file. If production has been reported for the operation, no option will be available. If an operator reports complete quantity for the production, the system will prompt for addition information depending on the operation type. Material Issued Reporting Screen, if this operation is a material issued point. Serial Number Reporting Screen, if the parent item is a serialized item and the operation is the last operation. Lot Number Screen, if the parent item is a lot item and the operation is the last operation. The system will ask the operator to report this in the detail reporting screen. PO Information Screen, if the operation is an outside process operation. Details about these screens can be found in the Report Additional Information section. Production Reported – The operator successfully reported for the production. Production Suspended – The operator did not report for the production and will be suspended. Production Continued – The operator did not report for the production and will continue without an operator. Production Canceled – The operator canceled the production. If the order is going to be closed, the system will display “Order Complete” to the right of the quantity. Press Enter to continue. If a production is successfully reported, a production transaction will be created. If BOMP Global Setup field 21, Immediately Post For Completed Scan Trx, is “Y”, the operator will be able to post this transaction immediately. Otherwise, a manager can review the production transactions before posting them. After reporting the production, the prompt will return to the Operator ID field or Order Number field based on the BOMP Global Setup. 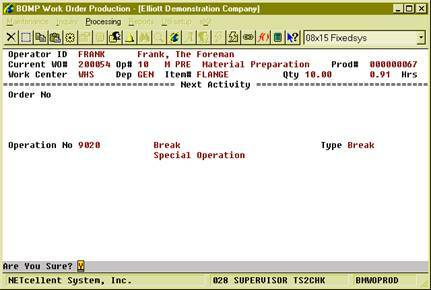 If the operator’s next activity is a break, meal break or End Of Day logoff, the system skips the third stage and automatically suspends or continues the production based on the setup in the work center file.